Watch a Video of Me Crossing the Finish Line at the 65 Roses Climb! 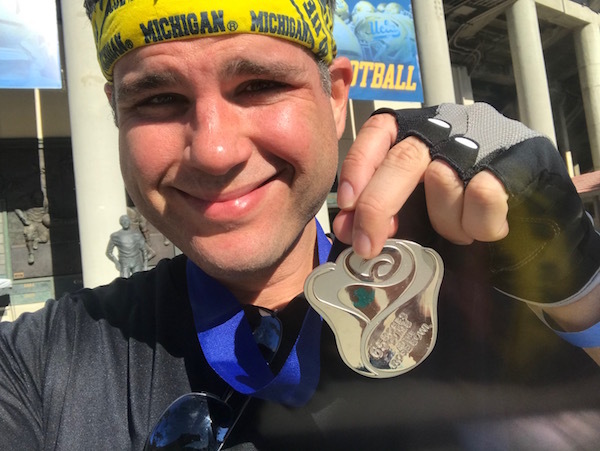 (Race Recap) | Keep It Up, David! This is the sixth year I’ve participated in this event, which has jumped around town since I first got involved. 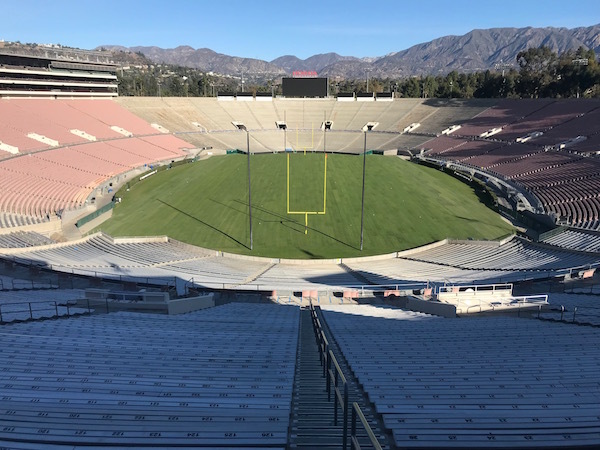 My first three races were in a skyscraper, then, two years ago, it moved to the historic Coliseum, and then last year it moved to the Rose Bowl, where, they say, it will be held for years to come. 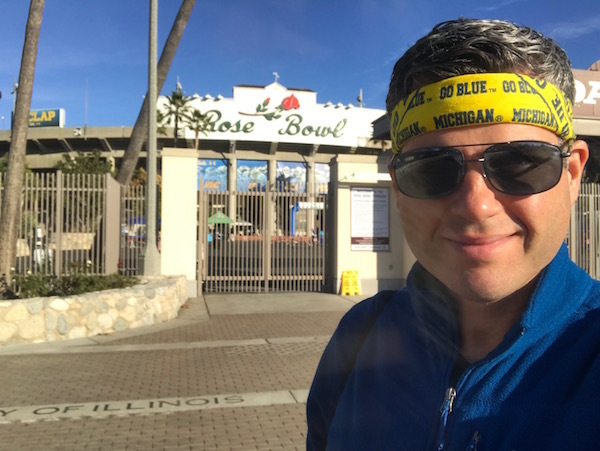 I love racing in the Rose Bowl because it’s grand, iconic, and just plain cool. 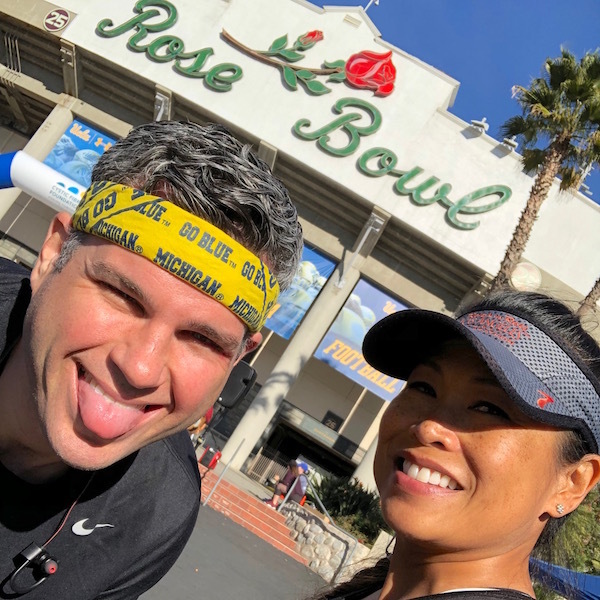 And I got to see all parts of the Rose Bowl, because the race course includes nearly every aisle. You run up an aisle, then over to the next one, then down, then over to the next one, and so on and so forth. All the way around the stadium! They say the race covers 3,000 steps. 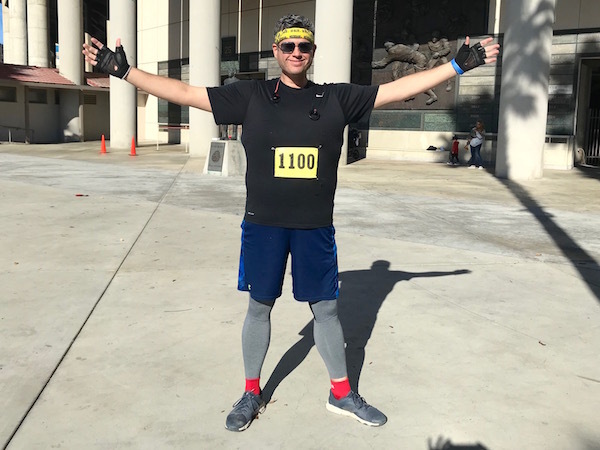 I was excited to see what I could do, because I wasn’t feeling great at last year’s race, and I’m sure my time was affected when I paused a bunch of times because I felt like I was gong to barf. I was feeling good this year, though, with no desire to hurl! 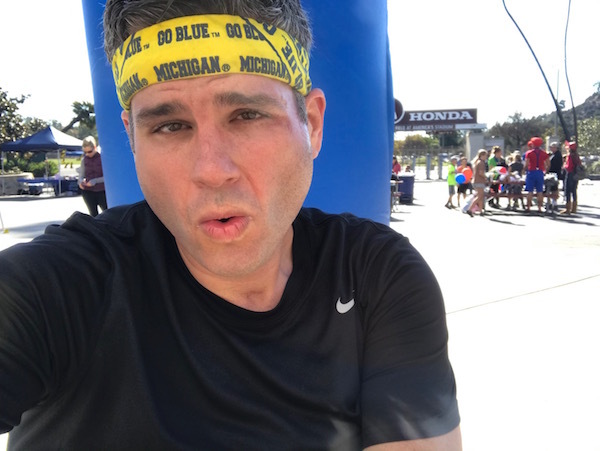 My friend Paul runs the timing company, and he gave me the only yellow bib, which matched my yellow University of Michigan bandanna. GO BLUE! Everyone else had white bibs. I wore good ol’ lucky number 1100. 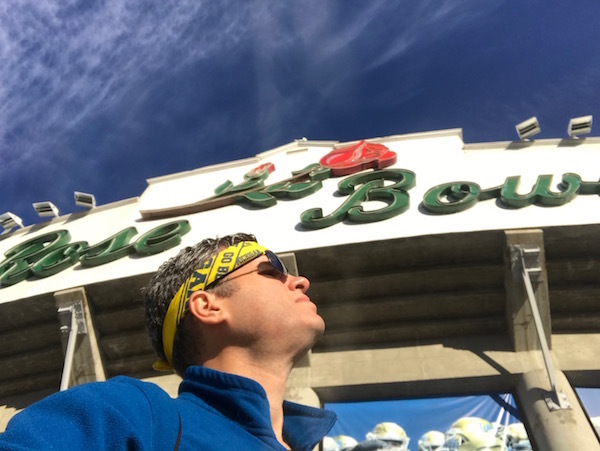 I was the third person to enter the stadium at the start of the race, and I tried to stay on the heels of my buddy Corey, who started ten seconds before me. Corey, though, is a super speed demon who ended up winning the whole shebang, so he started to leave me in his dust pretty quickly. The thing I like least about stadium races is that they include down portions, and racing down stairs is dangerous and, as I’m a klutz, makes me feel uneasy. 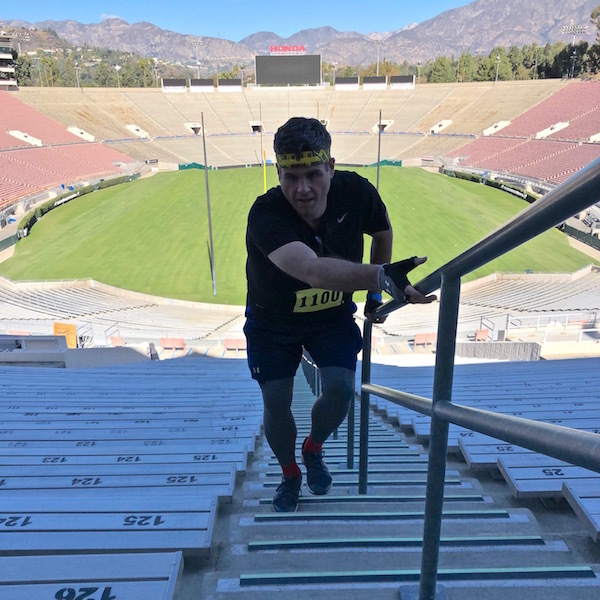 What’s nice about stadium races is that you everything is broken up – you never run up (or down) more than about 200 stairs at a time, before switching to a run over to the next aisle. Despite the repeated switching from one form of exercise to another, it’s still a devastatingly arduous race. Stairs are exhausting, and running isn’t exactly a walk in the park. Plus, there was a lot of passing required. I was competing in the full course, but lots of people only did the half course, where you stick to the lowers halves of the aisles and never climb all the way to the top. So faster people were passing me, and I was passing slower people who were on an easier course. My awesome friend Madeleine captured the final minute of my race on camera, including when I crossed the finish line, and I put it on YouTube. I pass at least half a dozen people in the video alone! That’s Madeleine cheering me on during the video, and here we are getting ready before the race. There were some timing issues at the race, unfortunately, because a kid accidentally kicked a piece of timing equipment and some data was lost. But my time was 24 minutes and 2 seconds – exactly 20 seconds slower than last year. I was initially bummed that I didn’t set a PR, until I learned that this year’s course was different, longer, and harder, with two more ascents than last year. Had I done the same course as last year, I probably would’ve PR’ed! I know I gave the race my all, and that’s always a win! A huge thanks to Ann, Dana, and Suzanne, all of whom made contributions to the Cystic Fibrosis Foundation so that I could participate in this race. Thank you for the donation and support! Follow me! I’m @keepitupdavid on Facebook, Instagram, Twitter, and Snapchat. There’s also a “Sign Me Up” box on this page (at the top of the right-hand column) where you can subscribe to receive new posts via email! This entry was posted on Tuesday, December 4th, 2018 at 5:42 pm and is filed under Uncategorized. You can follow any responses to this entry through the RSS 2.0 feed. You can leave a response, or trackback from your own site.